BPRL Recruitment 2019 - Apply Online/ Offline for Managing Director Post in Department of Personnel & Training, BPRL, New Delhi. 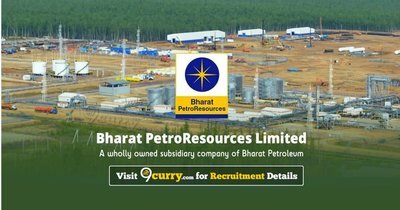 Online Applications are invited by Bharat PetroResources Limited (BPRL) from 12 Apr 2019 to 20 Jun 2019 for 1 vacancy. 2 years of residual service as on the date of vacancy w.r.t. the date of superannuation. 3 years of residual service as on the date of vacancy w.r.t. the date of superannuation. 1. The applicant should be a graduate with good academic record. 2. Applicants with Technical/ MBA qualifications will have added advantage. The applicant should possess adequate experience at a senior level of management in a large organization of repute. Eligible candidates may apply online at BPRL's website (direct link is given below) from 12 Apr 2019 to 20 Jun 2019. Candidates log on to https://pesb.gov.in/ . Go to "Vacancies" & Select the desired post. Click on "New User”, if you are a new user. Eligible candidates fill up the Application Form online against this Job Description on the website of PESB - http://pesb.gov.in/, take a printout and send it offline to Smt Kimbuong Kipgen Secretary, Public Enterprises Selection Board, Public Enterprises Bhawan, BlockNo. 14, CGO Complex, Lodhi Road, New Delhi-110003 on or before 20 Jun 2019 03:00 PM, Along with all required documents & Certificates in support of their age, qualification, experience, cast, etc. certificates & testimonials.